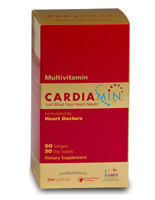 Bringing together the best minds in cardiology and heart failure research, CARDIAMIN was designed to meet the unique nutritional needs of people with heart disease or chronic heart failure.CARDIAMIN provides a carefully selected blend of vitamins and minerals while avoiding those which can be harmful or counteract medications commonly used by people with heart disease or heart failure. The CARDIAMIN dose is specifically chosen to match leading clinical research on the proper amount needed for people with heart disease. For daily use, CARDIAMIN is a perfect choice for anyone with pre-existing cardiac disease or heart failure to comply with the American Heart Association guidelines for prevention of future complications (“secondary prevention”).